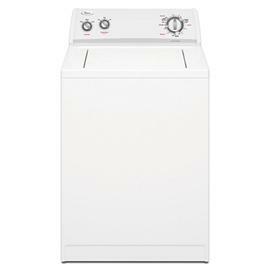 The WTW5100VQ model is a top loading washing machine provided by Whirlpool. Basically standard, it comes with the essential features necessary for washing machine users. The model comes in a sleek, white design with a porcelain washer to ensure durability. Made for the contemporary household, it easily blends in with any décor. Additional features include an automatic bleach dispenser, auto temperature controls and a quiet was noise reduction system. Dimensions of the TW5100VQ model include a depth of 25.5 inches, height of 43 inches and 27 inches in width. - Auto temperature control automatically combines hot and cold water to get the exact temperature needed for each load. - Automatic bleach dispenser instantly releases bleach at strategic intervals for a more sufficient clean. - It comes with a super capacity plus white porcelain washer that can take up to 3 cu. ft. capacity allowing for large loads for a faster wash.
- It allows for a two piece clothes mover agitator for a high quality wash.
- The model has 9 wash cycles which includes normal, delicate and casual cycles. - Three water levels to accommodate each load size possible. - Three temperature settings to match the quality of fabric being washed. - The quiet wash noise reduction system feature allows for a minimum amount of noise during operation. The Whirlpool WTW5100VQ is cheaper than most models and comes with the standard features needed by every home owner. Its size is perfect for those who don?t have much space to spare. Unlike most models, the product can be very quiet when operating and only produces minimum vibration. The various water level options allow for different load sizes and the temperature settings make sure that each fabric is treated accordingly. Cycles are available via nine different settings including delicate, normal and casual. An automatic bleach dispenser is made available to strategically disburse bleach at strategic times to achieve maximum washing quality. White porcelain is utilized for a more durable machine that won?t chip or fade with use. The model is also small enough to fit within small spaced areas but large enough to accommodate large load needs. The model is not Energy Star Certified and therefore may use more energy compared with other washing machine types. A standard model, it does not come with more advanced features available with some of Whirlpool?s upper line products.